I was a spoiled dog owner that never had to clip my dog’s nails up until now. My dog had a concrete paved backyard to run around in at my parent’s house which filed her nails down naturally. Ever since, I moved out of my parent’s house, the daily walks weren’t doing much for my dog’s nails and it started to grow quickly. She was never used to the whole nail cutting process so it always seemed like a struggle when that day came. I have turned to a few nail clippers on the market without much success. Some of them were either too finicky or cut my dog’s nails too short to the “kwik”. Kwik is the blood supply to the nail, once you nip this, you will be in a bloody mess and should reach for some septic powder or household flour. This made the whole nail cutting procedure even worse for my dog. Sometimes, I thought my dog might end up even biting me with all the struggled that was involved. I knew there had to be a clipper out there that could take the stress out of dog nail clipping. 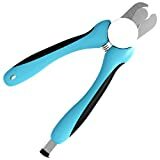 After much research to find the best dog nail clipper out there, I decided to go with the OmegaPet nail clipper on Amazon. Hey, it received over 500 positive reviews, so it can’t be that bad I thought. I have to say that I lucked out this time, I found the OmegaPet nail clipper to be safe, sturdy and quick to get the task done. This OmegaPet nail clipper made cutting my Pit Bull’s nails very easy. Best of all my my Pit Bull Phoenix became accustomed to her nails getting clipped quickly and efficiently! Here are a few cool things I love about the OmegaPet Dog Nail clipper compared to others on the market. It is heavy duty and constructed from steel so it doesn’t feel flimsy in your hands. It has an ergonomic design for large and smaller hands, very important as you want a nice grip on the clipper while trimming your dog’s nails. The nail file is included and there is a compartment for it in the left handle. 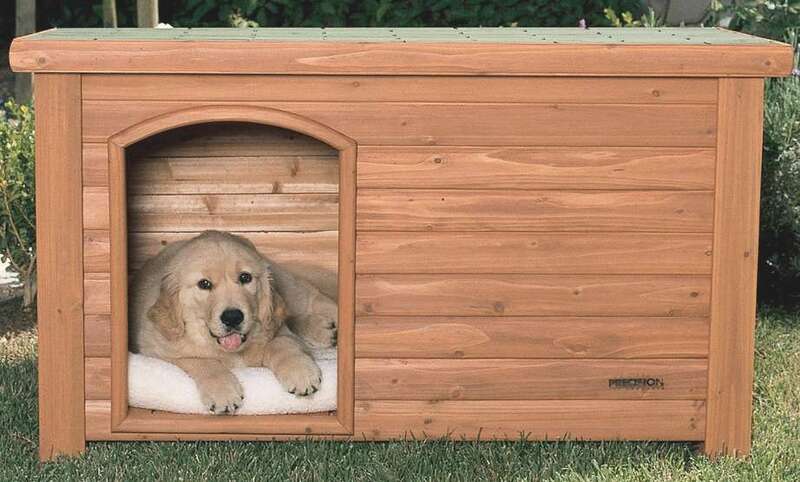 Best of all it has a safety guard feature which prevents you from cutting too much nail and possibly hurting your dog. Now that I finally found the best dog nail clipper for my needs, the next step was to get my dog accustomed to nail clipping. How to make nail cutting easier on your dog? If you have trained your dog to stay calm during nail clipping then great, the OmegaPet nail clipper should make your experience even better. But if you are like me who had to get your adult dog or puppy used to nail clipping then read on. Since, my dog didn’t associate nail cutting to be a pleasant experience from the beginning, I had to rewire her brain through positive reinforcement. First you want to get your dog’s favorite snack out prior to getting started on nail clipping. Most dogs love cheese and pepperoni which is what worked with my dog. Let your dog sniff the snack but don’t give to him or her till the task is accomplished. I would start out clipping 1 or 2 nails per day followed by an immediate reward. After 2 weeks of doing the same, my dog associated nail clipping with a positive reward. I can’t begin to tell you how much of a relief this was for me as a dog parent. Today I have a happy dog and that makes me a happy dog owner. Using the OmegaPet nail clipper and safety guard, I no longer had to worry about cutting too much nail. My dog’s “kwik” also started to recede with every nail clipping as it should. 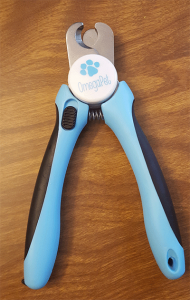 Purchase the OmegaPet dog nail clipper today and save! I believe this may just be a holiday promotion but purchase 2 OmegaPet products and use Promo code: OMEGA121 at checkout & Receive a free dog brush! Thank for visiting our blog & be sure to check out our doggy group on Facebook @ Mixed & Purebreds.